I discovered the instances in my home lab were not being protected by the neutron security groups I’d set up for them – what followed was a week-long odyssey to discover the culprit. IPTables rules were being put in place, and every other aspect of Neutron networking was just fine. Making things more mysterious, a test deploy on my own desktop, with the host running Fedora 23 and the containers running CentOS 7, did not manifest the issue. 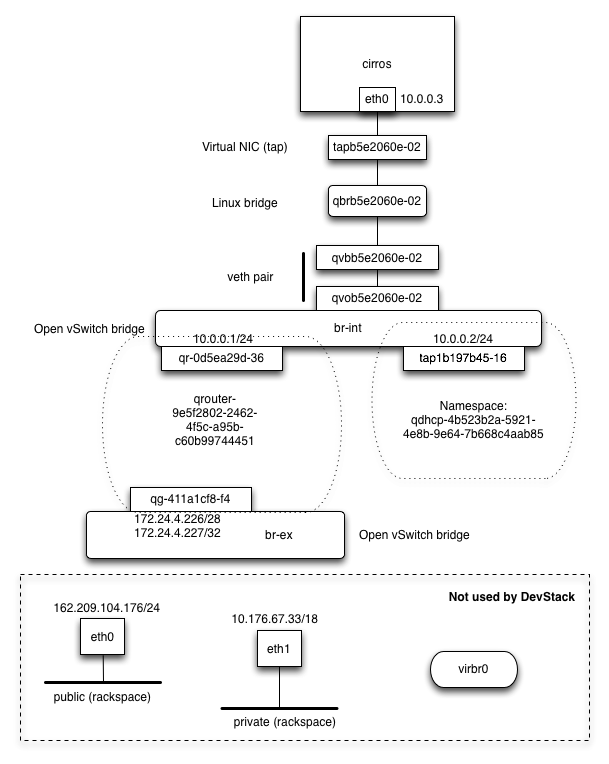 A handy diagram from the excellent “OpenStack Hackspace” – click image to check it out. Security groups are applied to the tap interface closest to the virtual machine, shown above (not mine – click the image to see the rest of that excellent tutorial). It turns out there’s a pair of kernel tunables that govern whether or not iptables rules are applied to interfaces that are members of a bridge, as in this instance. It also turns out that Red Hat, for some reason, toggled the default value of this tunable to 0 after RHEL 7 was released. And this needs to be set on the outer host, if you run your OpenStack cloud in containers. If not and/or otherwise, you need this set on your compute nodes as this is where security groups are set.